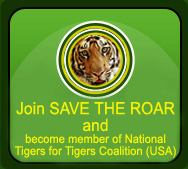 USFWS has been the federal funding agency for the Tiger Trust. With its support, Tiger Trust has been able to conduct legal training workshops in the states of Assam, Rajasthan and Madhya Pradesh. Recently, USFWS has approved the proposal presented by Tiger Trust for holding advanced capacity building workshops for the forest officers of Assam & Rajasthan. HSBC & Tiger Trust have been partners in two programs since 2005. HSBC has been supporting awareness programs in Rajasthan. They have supported annual educational programs and other public events in Ranthambhore National park. They have supported the medical camps for the forest staff in Sariska. They have now pledged to support the capacity building program for training in general without specifying any state. This partnership is under their Corporate Social responsibility grant (CSR). SNS Foundation was formed by a leading group called Purolator and is involved in various activities. They have been supporting parts of the training program by raising funds to carry out training programs in those states where there is no sponsorship for the events. SNS foundation has been providing visiting faculty to Tiger Trust for the capacity building programs. They also invited Tiger Trust for their “Green Gurgaon” campaign organized recently in National Capital Region, Delhi. ATREE is an NGO based in Assam which has recently joined hands with Tiger Trust in 2009 for imparting legal training to the forest staff. ATREE is working with Tiger Trust in order to promote socially just environmental conservation and sustainable development. Its mission is to generate rigorous interdisciplinary knowledge that engages actively with academia, policy makers, practitioners, activists, students and wider public audiences. ATREE plans to expand its horizon by inviting Tiger Trust to organize legal training programs for forest staff in other divisions of Assam as well. A tiger for Tigers, popularly known as T4T is one of the International Organizations supporting Tiger Trust. The US based student and alumni group is associated with Clemson University. Tigers for Tigers is specifically raising funds and awareness for the plight of wild tigers through in kind services and financial support. These partnerships allow Tiger Trust to increase the level of appreciation for these endangered animals beyond the borders and provide an additional outlet for community effort to be showcased internationally. Connecting others to the efforts being made in India for India’s wildlife is a way of empowering everyone involved.